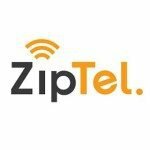 The ZipT app encrypts and compresses the data of every call it makes into as little as six kilobytes per second (kps), far lower than the minimum of 50kps needed by services like Skype – which was bought for $8.5BN by Microsoft in 2011... This very low compression allows ZipT to send clear voice signals over any phone or internet connection, even in a low bandwidth environment. This means users in a 2G network can call a person in a 4G network and vice versa with no loss of voice quality, while using up to 80% less data than rival services like Skype and Viber. With ZipT only one end of the call needs the app, its costs are set on a dynamic scale and the whole thing can be topped up online. ZipT can target the 1.9BN people around the world still using 2G phones and internet networks, as well as more advanced nations with 3G and 4G networks. 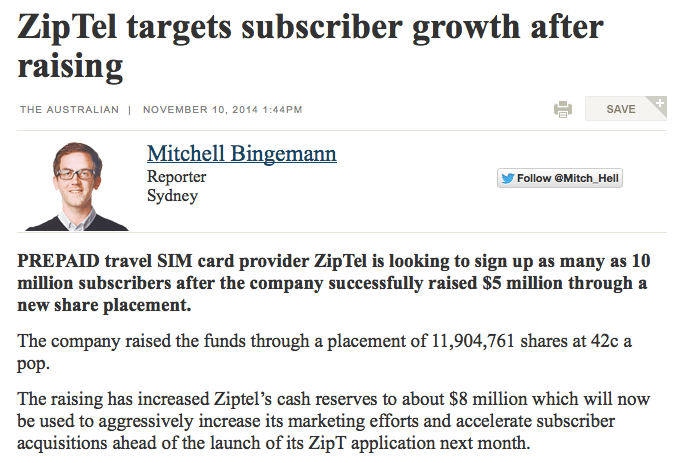 The placement of 11,904,761 shares was completed at $0.42c a share, increasing ZIP’s cash reserves to around $8M. Fourteen new institutions are now ZIP shareholders and long-term holders. 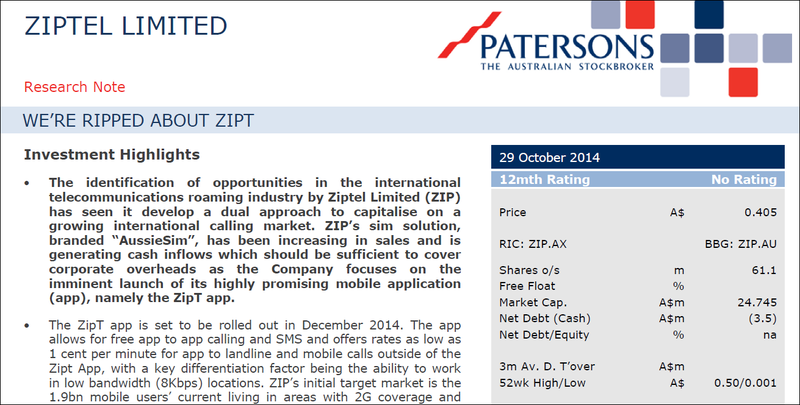 Major shareholder K2 Asset Management participated in the raising to maintain its 16.3% holding in ZIP. 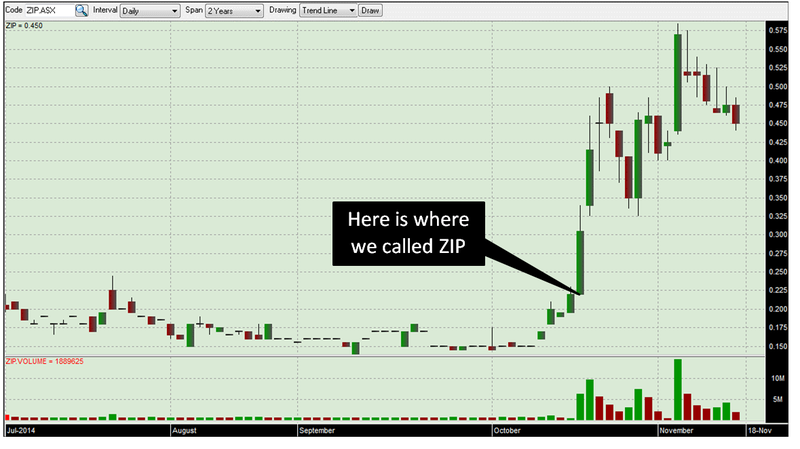 So ZIP is cashed up for the global launch of ZipT – but the money won’t just sit in the bank account for a rainy day. ZIP wants to make it rain paid subscribers! But it’s not stopping at 50,000 – ZIP’s ambition is to have millions of users sign up. ZIP has budgeted $3.6M to acquire the first 5.6 million users of ZipT, with over $300,000 allocated for social media marketing. ZIP’s six month target is one million users, then scalable targets rising to 10 million and then up to 50 million in the first year of operation. So how will ZIP get all those subscribers? To start with it’s working hand in hand with Mpire Media , a Western Australia advertising and software group run by the $60M net worth tech entrepreneur Zhenya Tsventenko. It has a vast network of global affiliates and this marketing agreement will see Mpire work to draw in one million paid subscribers. ZIP has secured a distribution agreement with AirLoyal, a leading Indian mobile advertising firm that will promote the app across India and South East Asia’s enormous mobile markets. The deal will see AirLoyal distribute ZipT across its user base and deliver up to one million paid subscribers, as well as continue to promote the app amongst India’s tech-savvy population. 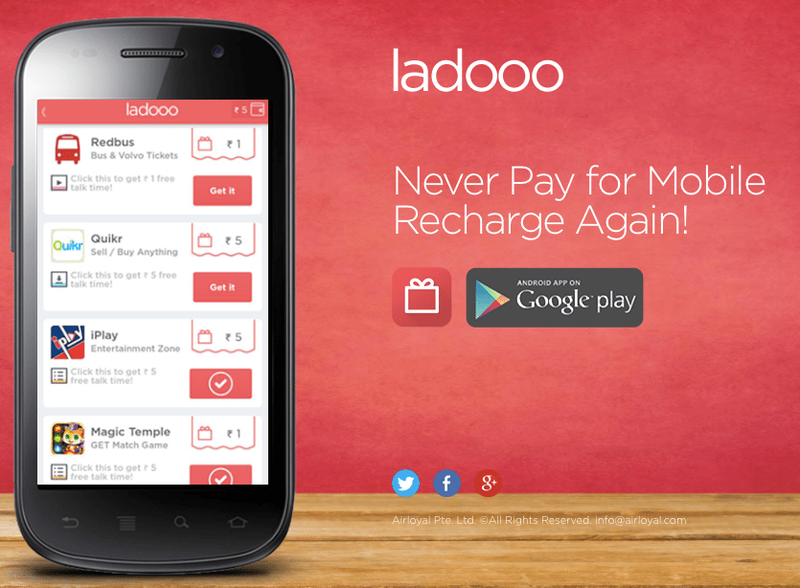 AirLoyal operates the Ladooo mobile platform, which has millions of users and 30 global brands as clients including Amazon, FlipKart and TicketGoose. Between the agreement with Mpire and AirLoyal, ZIP says it has the potential to acquire up to 5 million paid subscribers for ZipT within 12 months. Add the $5M cash injection into the mix and you can see why ZIP has its sights set very high – with extra advertising, promotions and marketing (and maybe even some more distribution agreements), between 10 and 15 million paid subscribers could be possible – and then it’s onward to 50 million and beyond. Here are some of the best quotes from Keaton Wallace: “It may seem as though it’s happened overnight on the ASX, but it hasn’t happened overnight for us. It has taken four years and a huge amount of time and effort.” “There is recognition we have a global proposition here. It’s not product for small market, it’s a product targeting everyone in the world with a smartphone.” Couldn’t have said it better ourselves! 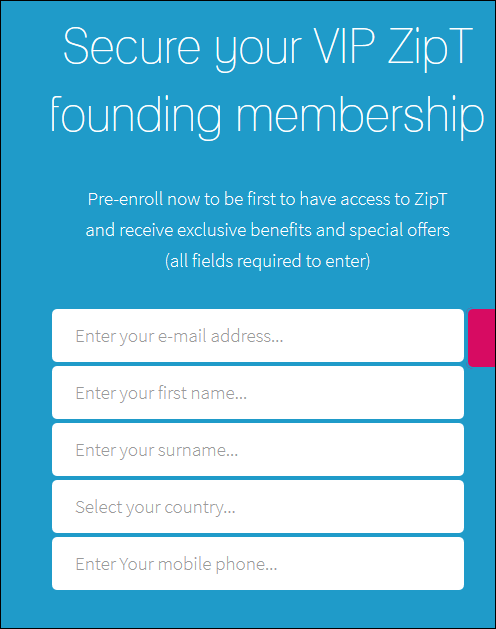 In just a few short weeks December will be upon us and ZIP will be launching its ZipT telecoms app on the global market. The team have spent four long years getting this launch ready and now the moment has arrived. 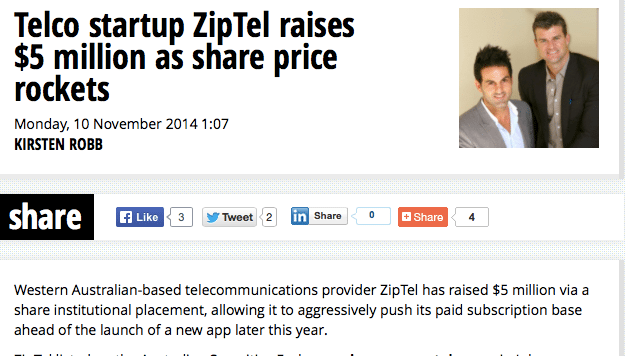 ZIP has developed an innovative and scalable product – ZipT – to take on the world’s $1.7 trillion dollar telecoms sector. It’s pulled in a combined $10M through two successful capital raises, and secured two distribution agreements to give ZipT a huge base of paid subscribers and marketing support. The only thing left to do is to hit the start button. 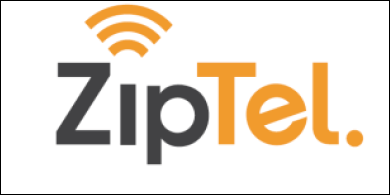 At The Next Tech Stock we are counting down the days and will be keeping a sharp eye out for any news from ZIP on a date for the global launch of ZipT. After that, we’re sure ZIP will be ringing in the New Year in more ways than one! ZipT App Now Available in Key Markets – Exponential Growth Imminent?